Using a case of hunting out of season in 1888 to explore deer hunting in the 19th Century and the history of deer management in Pennsylvania. It was the Monday before Christmas in the winter of '87. It had been a relatively mild, wet winter up to that time with little snowfall, mostly rain. Wilson and Bill set off from Fayetteville to South Mountain to do a little deer hunting, and then they shot a deer and got in trouble for it. This is a story of deer management in Pennsylvania, and the attempts of the state to effectively manage the deer population and how county authorities tried to enforce the laws. Hunting laws in Pennsylvania date back to the formation of the colony. In William Penn’s original Frame of Government of Pennsylvania in 1683, he granted all landowners the freedom to hunt on the lands that they own. 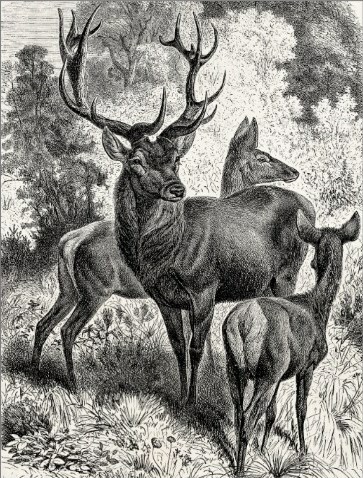 Provincial governor, Sir William Keith, would enact Pennsylvania’s first game law in 1721, which set the deer hunting season from July 1 to January 1. Pennsylvania’s original 1776 constitution granted the right to hunt on their own lands and on public lands. The constitution also included the phrase “in seasonable times” which granted the new state the authority to set specific hunting seasons. Throughout much of the 19th century, the State Assembly would do just that in tweaking the various hunting seasons, changing the start and end dates, and changing the laws such as placing a ban on killing fawns, using dogs to pursue deer, or banning Sunday hunting. In 1851, deer hunting of any kind was banned in Franklin County for five years. * By the turn of the 19th century, there were only around 5,000 deer in the entire state. To put that in perspective, there is an estimated 1.5 million deer in the state and annually over 100,000 are hit by cars. Market hunting was big business in the 18th and 19th centuries. It involved harvesting deer for the sale of meat and their hides, which were then sold on the market. Venison and deer hides were luxury items in Europe, and were shipped out in large quantities to European markets. Pennsylvania hunters during this time period claimed to have killed as many as a hundred deer each fall. The state tried many solutions to curtail the rapidly shrinking number of deer left in the woods of Pennsylvania. The laws though were mainly ignored. Local authorities struggled with enforcing the laws, and relied on citizens coming forward with information about hunters breaking the laws. This would eventually lead to the creation of the Pennsylvania Game Commission in 1895, which still is responsible for wildlife management in the state. So why did Wilson and Bill get into trouble? On one of the indictment documents*, the charge leveled against them was “killing deer out of season and having the same in possession out of season.” They were charged with killing a deer on Monday, December 19, 1887. In 1869, the deer hunting season was set from September 1 to December 31, and, from all available information, it appears that is where it stood in 1887 when Wilson and Bill killed their deer. At the time, it appears they were within the hunting season, and they were not out hunting on a Sunday. Additionally, they went on to store the deer in their cellar, which was also allowable under law as long as it was in season. The indictment papers are vague on the details saying only that the two pursued, shot and killed a wild deer. It was illegal at the time to use dogs in hunting deer. That the indictment referred to “pursue” most likely indicates that this was the specific charge. The law on the books at the time stated, “no person shall pursue any elk or wild deer with dogs”. Dog hunting involves using dogs to chase deer to where the hunter lays in wait. While it’s not known if they owned dogs in 1887, tax assessment books started keeping track of dog ownership in the 1890s, and in 1891 both Wilson and Bill are listed as owning a dog each. 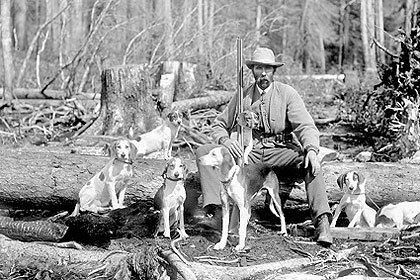 The practice of dog hunting deer despite being illegal was evidently such a problem that a law was passed in 1905 declaring the practice a “public nuisance” and that the dogs could be shot by anyone on sight. Whatever the reason for the initial charge, they were eventually dropped after the defendants agreed to pay court costs. *To view the actual papers and many other documents from Franklin County’s history visit the Archives’ Online Repository. Bob Frye, Deer Wars: Science, Tradition, and the Battle over Managing Whitetails in Pennsylvania (Penn State University Press: State College, PA, 2006). Gary Lewis, Jr., “The History of Deer Management in Pennsylvania”. Statecollege.com. November 29, 2010.
cspot, “History of Deer Management [forum posting]”. The Pennsylvania Sportsman Forum. February 11, 2015.